Katherine Lister, LMSW received her Master of Social Work degree from the University of Michigan and is licensed in Michigan as a Clinical Social Worker. She recently returned to the lakeshore after living in the Denver area for several years. She has experience in a variety of settings, including hospitals, private practice, group therapy and crisis assessment. 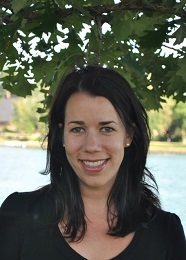 Katie especially enjoys tailoring the therapeutic experience to each client’s individual need. She has a passion for working with individuals and couples to explore life issues, improve relationships, gain insight and increase overall satisfaction in one’s life. Katie brings a sense of calm, safety and compassion to her work with clients. She is honored to be able to journey alongside clients during difficult times, create hope and empowerment, and provide guidance for those who desire to take an in-depth look at life. Katie specializes in working with adult and young adult clients in the areas of anxiety, depression, adjustment and relationship issues. She takes an integrative and strength-focused approach to counseling in conjunction with using Cognitive-Behavioral and Humanistic strategies.